I can't believe I almost forgot to post about our trip to Burch Barn! We've gone to this place for three years now and it's about an hour away from where we live. I had heard about it on Facebook and then had a LOT of friends raving about it, so we went the first time when Penelope was just real little. It's grown steadily each year with more and more people driving to it, but the things they offer there get bigger every year. We look forward to our trip every year, even Olivia and Jackson talk about it. This year we were lucky because the weekend we could go it was 51 degrees, and that's crazy for October and as we guessed, it was pretty busy. We usually go out for lunch and then start driving so the little girls nap on our way there. That gives us a couple of hours there before they close. Penelope was kind of grumpy that day but she perked up at the petting zoo. She was busy picking up corn on the ground to make sure all of the goats, cow, and pigs were adequately fed. Even Lucy really loved the goats, which kept trying to lick her. They have this big corn pit to play in and Lucy would have stayed in there all day. Penelope wanted no part of it even though every other year she's rolling around everywhere. Quick picture of Matt and I. They had these little tractor peddle cars and a little track for them to go on. Lucy was totally thrilled to be pushed around since her legs were too short to peddle. Penelope literally sat like this and whined because she wasn't moving. Didn't want to peddle at all, just thought it should move because she's on it. They had these home made tire swings and Lucy had the time of her life swinging on those. Penelope.. not so much. She cried because hers was spinning. Olivia and Jackson mostly did their own thing like the big slides and the corn maze so we hardly saw them. At one point Matt and I heard their laughs, clear across the place, and wandered over to see what was going on. There they were, both of them, in this hamster wheel thing trying to roll it across. Now, when we came in I saw a small baby, maybe just shy of one, rolling along just fine on its own. It took TWO of my kids to roll it. And there they are, laughing hysterically, falling on their faces, falling out of the wheel, Olivia banging her head on the side.... they were a mess. I convinced them to stop embarrassing all of us and go play chess. So that's what they did. They played like 3 or 4 games and people were giving them suggestions. Then one kid took Olivia's place to play Jackson, and Jackson promptly lost in about five moves. I did manage to take some good selfies with all of the kids, though! This was supposed to be just Olivia and I but Penelope popped it at the right moment. Jackson said he wants this one framed for his room. Lucy wanted a picture with her mini-donut. Matt stood in line for awhile to get these and they did not disappoint. A very nice woman offered to take our picture with my phone by the side. She took five and this was the best one. I'm not even kidding. So much for Christmas card contender. HA! On the ride back everyone fell asleep and it was nice. It ended up being a really great day for it and I'm glad we got to go. Hopefully I'll share a couple of trick or treat photos with you tomorrow! I have a lot of stuff simmering on the proverbial stove right now and I'm a little overwhelmed. Considering I really burn a lot of stuff while for real cooking, I'm a little worried that me multi-tasking so many things right now is going to end badly all around. It's like my brain is refusing to acknowledge it isn't what it once was and is defiantly trying to prove otherwise. I sign up for things and start things without thinking any of it through and then later realize this is more than I can chew. I'm still on the PTO of Jackson's school. I'm only the Secretary but I feel kind of lame for not signing up for as many things as I used to. I at least know in that area I'm fairly maxed out. I'm thinking about joining the PTSA at Olivia's school. I haven't said anything to Matt because I know he would give me stink eye but I feel like I have no idea what's going on at that school and with Jackson going next year I really want to have a clue. We'll see. The next meeting is tomorrow so... we'll see. I'll leave it at that. Olivia is in a LOT of dance this year. That's actually not a bad thing because it's getting me out of the house two nights a week, even if it is just me sitting alone on a bench, I'm forced to put on pants and go. I'm getting some reading done while I'm there so that's kind of nice too. I have been working a LOT on my book. I really am struggling with this because my train of thought is really over the place and I can't focus on any one thing. I start writing something and then I get an idea for something else, so I'll do that. Then I forget what I was doing in the first place and where I was trying to go with it. I have an outline kind of worked out (mostly), I have a format kind of worked out for it and I've got some things written. It feels like a scattered mess right now but I'm confident I can get it together. I've been writing articles to get ahead for my commitment to the Duluth Moms Blog. As things post there I'll share them here so you can stay up to date on that, too! I have something percolating in regards to a Weightloss Challenge. I know I mentioned this last week or the week before, but I'm trying to get my ideas down on paper and actually commit to it and then bring it to you first. I'm hoping for a November 1 start, give or take a couple of days. I really, REALLY have to get serious about this and I feel like if I go this route I'm kind of forced into it and that might be helpful for others. Stay tuned. We are battling illness in our house, everyone is a coughing, booger mess. Lucy has it coming out of her eyes, she's got an eczema flare up right now, Penelope coughs all night, Olivia and I are coughing until we can't breathe, so far the boys seem to be doing alright, thankfully. As we come into November I have a LOT of appointments coming up and I'm kind of nervous about them. I have my lists of questions and I guess I don't know what to expect. I also need to get my follow up MRI done for my liver lesion or my... I'm not sure. Something in my mid-section. I'm losing track of it all, to be honest. But I know I needed a six month follow up to see if anything changed so that's got to happen before the end of the year. I guess I'm starting to feel really overwhelmed with life and I'm wondering how I ever thrived on this. I know I did because I see my old Facebook posts and read my old blogs and I'm really in awe of who I used to be. I could seemingly do it all and now I can manage getting dressed and maybe one other thing and I feel like I conquered the world. Before I was all over town, running errands, cleaning, volunteering, book reviews, my Etsy shop, and making things for the school by myself. It was nuts. I don't know, maybe it wasn't because I clearly loved it but man... it really makes me feel inadequate now, that's for sure. The rest of this week I'll share pictures from Boo at the Zoo (kids were adorable) and our visit to the Burch Barn in Spooner, Wisconsin (kids were adorable and hilarious). I hope you're having a good week. We're at hump day and I always feel like if we got to this point we can slide to the end of the week. This weekend is already shaping up to be bananas too, but that's alright. At least we're doing something, I suppose. Glad to be alive and all that. I just need it on the official record that this? This is book 105 for the year. I have OFFICIALLY finished my Goodreads challenge for the year. Don't be afraid to bring me cake or a gift. I'll accept either. Or both. Surprise me. I am almost afraid to admit the next couple of things: I don't like Broadway plays (or any theater really) and I'm usually not a fan of LGBTQ books. I have to be clear it's not that I don't support the LGBTQ community, I absolutely do and I will fight for equal rights until my last day. It's just that in a book... it's not my thing. Just like historical anything puts me to sleep, and Jodi Picoult makes me want to throw a book into the dump personally (and Nicholas Sparks- fight me), and some paranormal stuff is just TOO weird, it's not my thing. I actually kind of really liked this book. I really connected with Arthur right away because he's just so awkward and weird, he's literally everything that comes to mind when you think of an obviously gay young man. He's only in the city for the summer and he's not taking to it like he thought he would and he's losing touch with his friends back home. One accepts him for all that he is and the other (a guy) doesn't really and Arthur struggles a little bit with that and doesn't think his preference on who he is attracted to should come in the way of a long established friendship. He's just completely dorky and I liked him. Ben is exactly the kind of kid I would expect to have lived in the city for awhile. He's a little bit jaded, has a little bit of a chip on his shoulder, and he definitely doesn't believe the universe is out to help him. He's fresh out of a relationship that he thought was rock solid but definitely wasn't and so he's trying to figure out what's next. He's also realizing that once his best friend (who is totally OK with him being gay) gets into a relationship, that means he's kind of on his own for awhile... but he doesn't really know how to be alone, alone. I feel like the first couple of chapters set the book up for a really great story... but fell just a bit short. 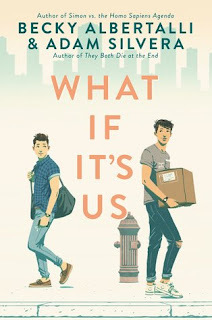 While the romance itself was kind of cute and it felt like you were with Arthur through the book (it felt more like I was with Arthur than Ben, even though Ben has his own POV chapters... it just never felt like you were connected with Ben) and you just want things to work out. You feel dedicated to finding "box boy" with him and wanting the universe to work for them. I will say... Arthur has some stalker-like tendencies, which is creepy. I don't care who you are, some of his tactics to finding "box boy" are kind of weird. But this book is full of drama coming from parents, friends, miscommunication, the universe, cultural and religious differences, and it's weaved together like a good YA book should be. Overall, I really liked it. Having never read anything else by Becky Albertalli or Adam Silvera (I know, guys- I know I'm behind in the times. Don't throw things at me. ), I wasn't really sure what to expect of this. I know some people say there are mentions of their other books and of course I missed all of those because I was clueless, but if you are a fan of theirs, you have that to enjoy in this book as well. I'm going to give this one a solid 4 starts because I did find myself laughing throughout and for every one thing I didn't like, there were two things I did like to make up for it... which gives the book a good, angsty feel to it. Way back when I started this blog in 2008 my only goal was to put up cute pictures of my kids and tell funny stories so my family who don't live near us could be up to date. Somewhere around 2010 I started gaining a lot of followers and it was mostly because I was sassy and snarky. I still am... just differently. I know it sounds stupid but dying on the table really changes you. Honestly, sometimes I'm physically and mentally too tired to really care about anything. But I have noticed that I'm generally nicer. I will admit that sometimes having a brain injury doesn't allow me to stop and thinking something through before I say it. I've struggled with that but I feel like I'm getting better as time goes on. I hate to say that I'm having a Perez Hilton moment but I am. I know I've had a few comments of people asking me when is sassy Sara coming back. I've ignored them for the most part and I know I blogged about maybe it's maturity or age, and the more I think about what it is... the less that I care. I just know I'm going to be nicer. I'm going to be more productive. I'm going to be more positive, I want to lift people up. But I swear to god, if you're wearing a romper I'm going to let you know you look ridiculous. I may even follow you to the bathroom and crack jokes about you being naked just to go pee. Because that's what real friends do. OBVIOUSLY. I'm going to be starting a fitness challenge pretty soon. It's going to be old school, I might even bring back the vlogs... that's assuming I can figure out how I did them in the first place. I will always give you the good and the bad. There's always going to be bad and I will never shy away from sharing that because what I am, and what I will always be, is 100% authentic. What you get on the blog is what you'll get in real life. Except in real life I'm not always wearing pants, or clean clothes for that matter, and my hair is in a messy bun so often it retains the shape when I take my ponytail holder out. I'm going to focus on giving you really good content but still have fun. I will always encourage people to email me if they have a topic they'd like to see me write about (sarastrand9438 AT hotmail DOT com) and I will see what I can do. I feel like I'm entering an entirely new season of my life and it's kind of weird, like I'm physically turning around a corner. And it's OK. I'm OK with this because I'm not the same gal I was all those years ago so hopefully you'll help me figure out what I'm supposed to do next. We have had kind of a busy two weeks which is why I didn't post much of anything last week and was quiet on the Facebook page this weekend. I have been feeling like a really crappy mom for oh... two years. I feel tremendous guilt over this and I know it's not rational but here we are. I feel bad because Olivia and Jackson knew me as a great mom always doing awesome stuff and now they have this version. Then I feel guilty Penelope and Lucy will only know this version and will never get that super fun mom because I'm not capable any more. So yeah. It's complicated and weird but I'm trying to come to grips with it. But I'm trying. I'm trying really hard to make sure they don't feel like I'm just leaving them without a mom at all. They had been wanting to see The House With A Clock In Its Walls as soon as they saw a preview, and of COURSE we can't ever go on the cheap $5 days because Olivia has dance. I had to pay full price. FULL PRICE AT A THEATER. I know you know that pain. Then we had to buy snacks. Do you know how much snacks were? All for popcorn and drinks. Not even larges! God. They want to see Goosebumps 2 (click on that if you want to watch it on Prime Video!) but good god I don't know if I can willingly for that much money over again. While I was there I had gotten a message from my old boss who is working at a local bookstore now saying she had someone buy four tickets to this Harry Potter event they were doing and wanted to donate them. She thought of us and messaged me. Penelope and Lucy are nightmares beyond 5 p.m. so that definitely is a no go, but Olivia and Jackson are into Harry Potter so I thought they'd like it. It was a lot of fun, it had a bunch of themed games and snacks. Olivia was easily the worst at the Quidditch game. Jackson raked in a ton of tickets playing games. Olivia is surprisingly freakishly talented at keeping a balloon afloat with a wand (or pencil because she didn't have a wand). That game was definitely her jam. Jackson was much better at the Quidditch game and he clearly had a technique down. Oh! And they got sorted- Jackson is Hufflepuff and Olivia is Ravenclaw, both pretty accurate for their personalities. That was a really fun night out. It felt so weird to be out of the house 4 of the 5 days last week. Then we had a busy weekend, more on that tomorrow, so I was pretty winded by Sunday afternoon. Ugh.